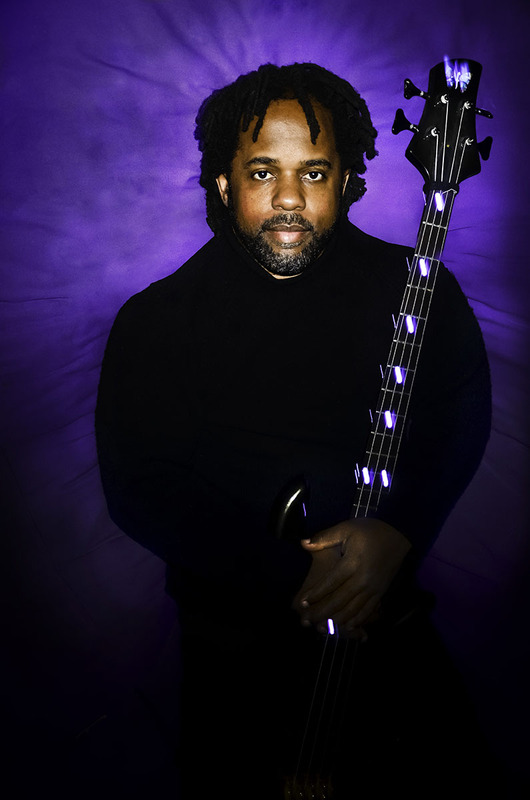 Victor Wooten is an American bass player and composer and a recipient of 5 Grammy Awards. He started learning bass when he was two. He has 4 elder brothers, all of whom are also musicians. Everyday after school they would practise their instruments. He started performing with his brothers in their family band—The Wooten Brothers Band when he was only six years old. 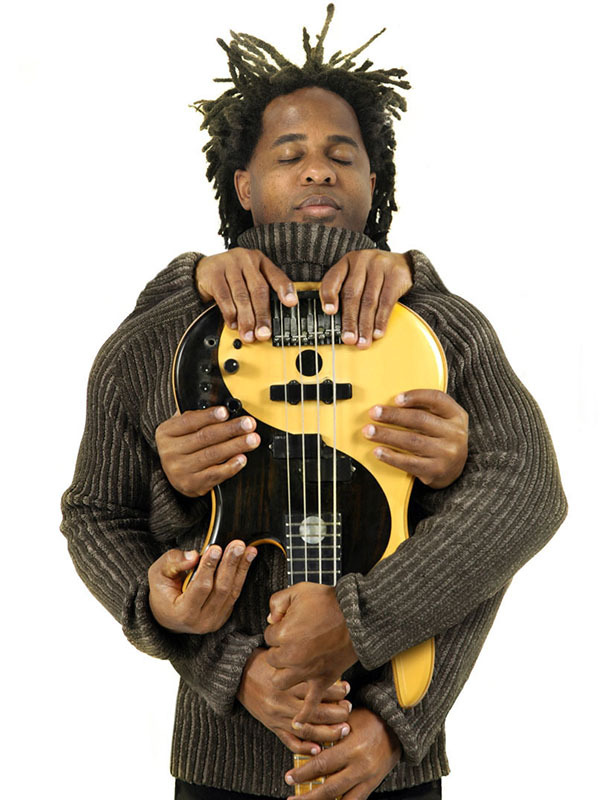 Victor joined the group Bela Fleck and the Flecktones as a bassist in 1988, which brought him recognition for his bass skills. He then released his own albums and created a workshop – Groove Workshop aiming to teach others bass. 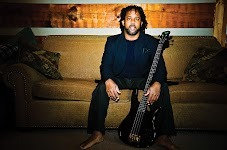 In 2000, Victor created a bass/nature camp — Victor Wooten’s Center For Music and Nature, which taught a unique combination of music and nature studies to students from all around the world based on Victor’s 40+ years of experience. Recognizing the connection between the two, Victor experimented and eventually developed an approach that could be shared with others to immediately help understand and play better music, as well as (and more importantly) improve all aspects of one’s life. Victor is one of the most respected musicians in the world. We interviewed Victor ahead of his debut gig in Hong Kong. Interview Questions by 訪問問題由 Christopher Johnson. Translated by 翻譯由 Sophie Lai and 和 Dicky Kwong. VW: I’m really excited to come to Hong Kong. It’s a place I’ve always wanted to visit. To be invited to perform here is a dream come true. Do you find more enthusiasm among fans in Asia as opposed to the west? VW: The listeners in Asia are awesome! They are definitely attentive and more polite. I can tell from the stage that they are totally getting it. Because I don’t visit Asia as often as other places, the audiences really make us feel welcomed. What are some of your favorite things you do to pass the time when you are not performing, during your tours overseas? Sightseeing for example? VW: I like to meet people when I travel. I do like to sightsee, but I prefer to do it with new friends who live in the area. Because everything is new to me, everything is worth seeing. I also like walking around looking at whatever is around me. I love nature, local music, and meeting interesting people. It’s easy to find things to do in new places. VW: Yes! Yes! Yes! I am ready to eat!!! What basses did you bring with you with this tour? Can you tell us about them? VW: I will be playing my Fodera 4-string Yin Yang Monarch bass. It’s the one I’ve been playing for many years. You’re a family man, a father of four. How does having your own family affect your songwriting and creative spark? 你家庭觀咁重，又有四個小孩子。你嘅家庭又有冇對於你創作音樂有重大影響呢? things to write about. The love totally translates into my music. Plus, my kids are all good musicians and singers. I can get ideas and inspiration from them. VW: I’m the youngest of the five Wooten brothers. When I was born, my brothers already knew they needed a bass player. That became me right away. So, they chose the bass for me. I was very lucky. We understand you had a birthday this month! Happy belated birthday wishes! How did you celebrate? Did you do anything special? VW: Thank you. My birthday, September 11, is always a special day. This year I spent it relaxing with my family. The following day we went to a fun place called Escape Nashville where they put you all in a room and give you one hour (and a few clues) to find you way out. It was so much fun. The way that give back to music and society is so amazing! How did you first come up with the idea of the Victor Wooten Center for Music And Nature? VW: After taking my first class in Nature Studies back in 1991, I realized that that class was a good model for teaching music. Also, a good friend of mine was already hosting Fiddle (Violin) camps in Nashville, Tennessee . Those two programs, along with my strong desire to share, helped solidly my own ideas for how I wanted to run a program. I held my first camp in the year 2000. You are an inspiration to musicians all over the world! What would you say to someone who is just picking up a musical instrument for the first time, and wants to learn? VW: I would like to tell everyone that you are already musical. You just need to learn how to express your musicality in a new way – through an instrument. No matter how much you learn, don’t forget what you already know. And, remember to have fun. Sharing your fun with others will make it even more fun. Do you have any plans to go back in the studio any time this year? We’d love to hear more of your solo work. VW: Yes! I’m hoping to start recording my new record this year. Your first solo album "A Show Of Hands" was absolutely mind blowing! Years and years later a lot of bassists are still trying to figure out what you were doing on that album! Did you expect that your bass playing would have such a huge influence on the world of music, way back then? VW: Although I knew that I was doing something different, I definitely wasn’t thinking about the effect it would have on the world. I was focused on getting my ideas out and recorded in a way that made me happy. Sometimes, getting your ideas out of your head and heart can be difficult. I hadn’t heard a solo recording done that way before so I didn’t have a model to rely on. I was really happy that I was able to make a record I was proud of, and I hoped a few other people would like it. The fact that it has inspired people around the world is an amazing bonus. You have some amazing concepts about music as a language and a pathway for spiritual growth. How did these ideas develop and how has it affected you as a musician and a person? VW: These ideas came about because of how I learned to play Music. I was really young when I started playing with my brothers. I was learning to speak Music at the same time and in the same way I was learning to speak English. As I grew and became a teacher, I realized how special I had been treated by my brothers and my parents. I also realized that all children are treated that way when learning their first language, but not when learning music. Realizing that we are comfortable talking about all aspects of our lives, I wanted to help others become just as comfortable speaking with music. Treating music as a language still seems to be the best way to do it. This way of thinking has made me a better musician and, more importantly, a better person. You’ve laid down some of the most amazing bass tracks on many records. Your playing just comes to life, whether it’s a groove or a solo. There’s an unmistakable feeling of joy and excitement on your bass lines. How do you convey such emotion in the things you play? VW: Again, thank you. The same way you can hear the joy in someone’s voice who is excited about life. You should be able to also hear it in their music. Because of how I think (or don’t think), it allows me to use music like a language and express myself clearly. 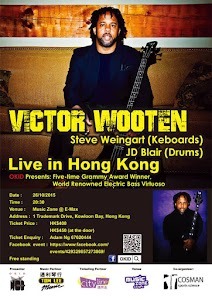 Victor will be performing for the first time in Hong Kong on 26th October 2015 at E-Max. Grab your tickets now!